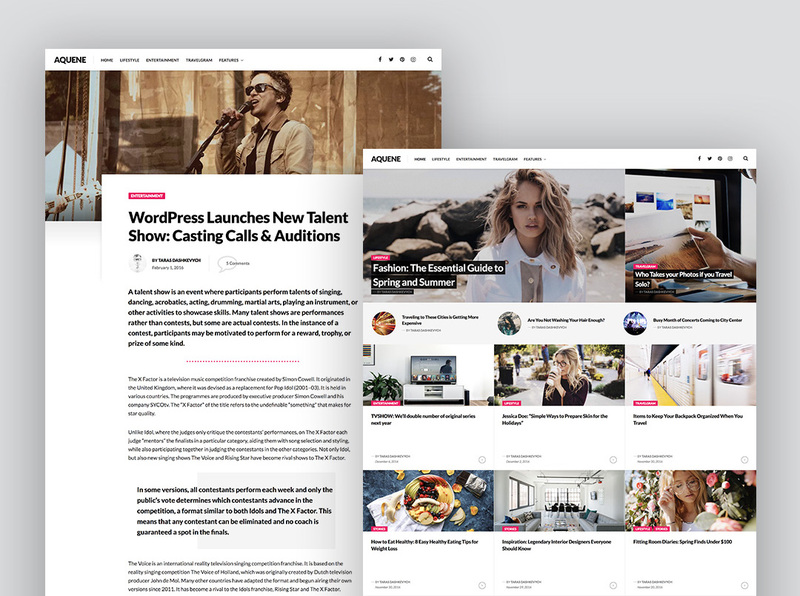 Aquene is stylish and lightweight theme specially crafted for magazines, newspapers or personal blogs. By taking a minimalist approach to design, theme is focusing more on readability to make the content more appealing, engaging and usable. Best of all, your sophisticated website will look great across all devices. Our premium products come with a license key, which is needed in case you want to receive automatic updates and support for as long as your license is valid. While premium products are fully functional without entering a license key, you won’t get notifications about updates in your WordPress dashboard. So, it’s better to keep it active to gain access to security updates, bug fixes and new features. Learn how to locate your license key and activate it. We highly recommend to install Jetpack plugin which provides powerful features previously only available to WordPress.com users. 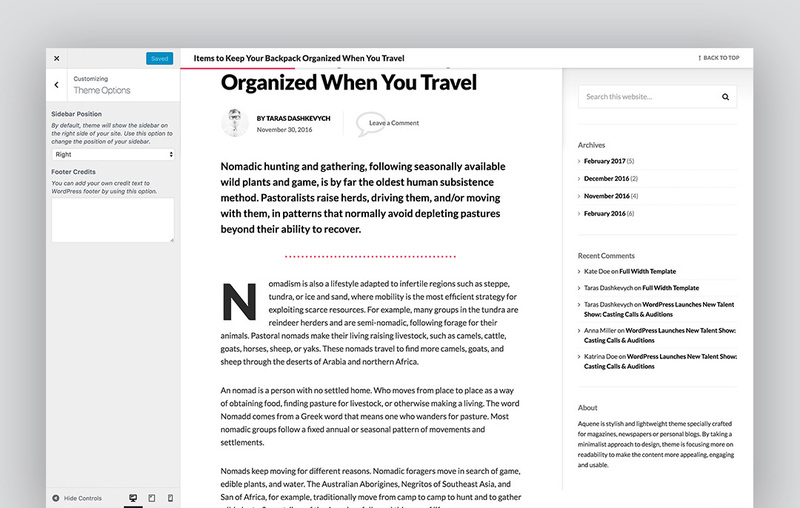 Jetpack is developed by Automattic, the makers of WordPress.com. After the plugin was installed and activated, you will be asked to connect to WordPress.com. If you don’t have a WordPress.com account, you can create one. It’s totally free and easy. Note, it does not force you to build a site on WordPress.com. The reason you should connect to WordPress.com is because many of Jetpack modules are integrated with specific robust functionality of that platform. 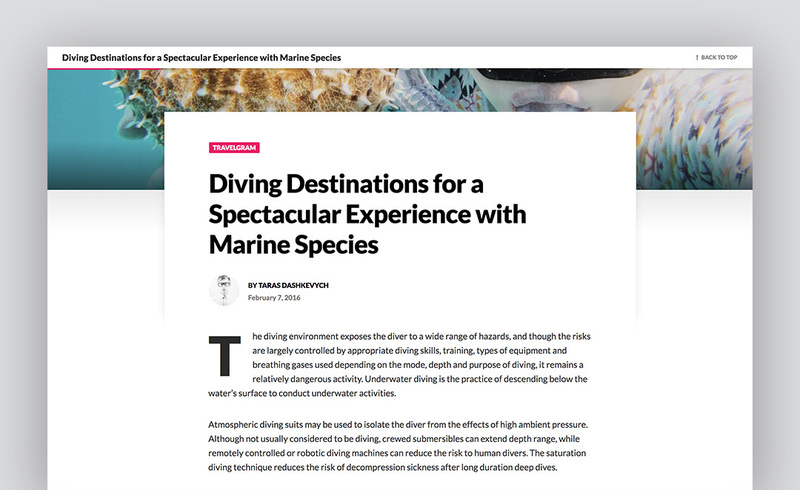 Aquene allows you to display selected posts in a featured area above the blog. These posts are selected by assigning them a specific tag of your choosing. 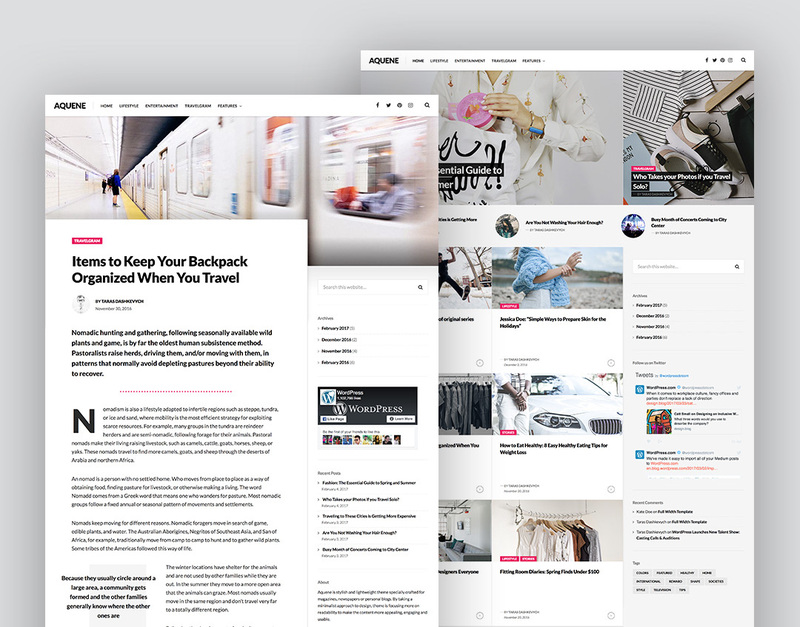 Navigate to Customizer → Featured Content. In the Tag name field, add the tag you’ll use on posts to be displayed as Featured Content. For example, you could use the tag featured. Click Save & Publish. Add the same tag to the posts (or pages) you want to display in the Featured Content area. Note: This feature requires Jetpack plugin installed on your website. In the Customizer, go to Theme Options. Select the desired alignment from the Sidebar Position drop-down menu. Header and Footer custom menus can be configured via Appearance → Menus. 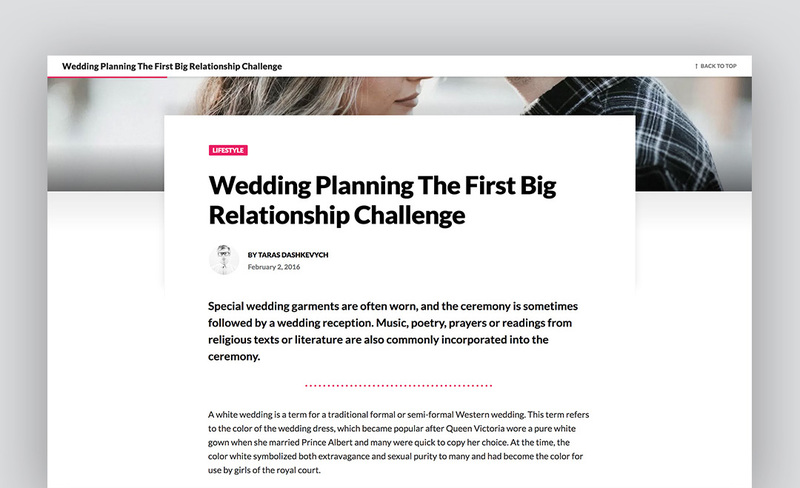 Aquene supports a social links menu that uses icons in both the header and footer to connect your readers to your social media profiles. Create or edit a page, and assign it to the Full-Width Page template from the Page Attributes box. Sidebar widget area: displayed on the right or left side. Footer widget area: displayed at the bottom of your site. If there are no widgets in the sidebar area, the theme automatically adjusts to a three columns layout in archive views and single column layout in single-page views. If the sidebar area has widgets then the theme will have a two columns layout. Aquene supports Featured Images on both posts and pages. Each post’s Featured Image will be displayed under its header. If the Featured Image is not assigned then the theme will display a gray placeholder in archive views. Aquene offers a series of custom styles that you can use on your website. The introduction text can be displayed between the headline and body of each post. 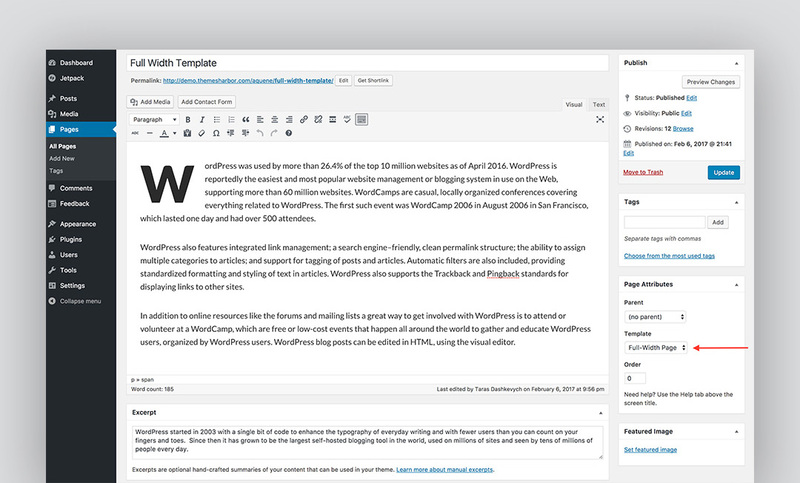 Add your intro in the Excerpt field of each post, which you’ll find under the Editor in your Dashboard. In order to have a pull quote in your content area, simply add a class of alignleft or alignright to a blockquote element. 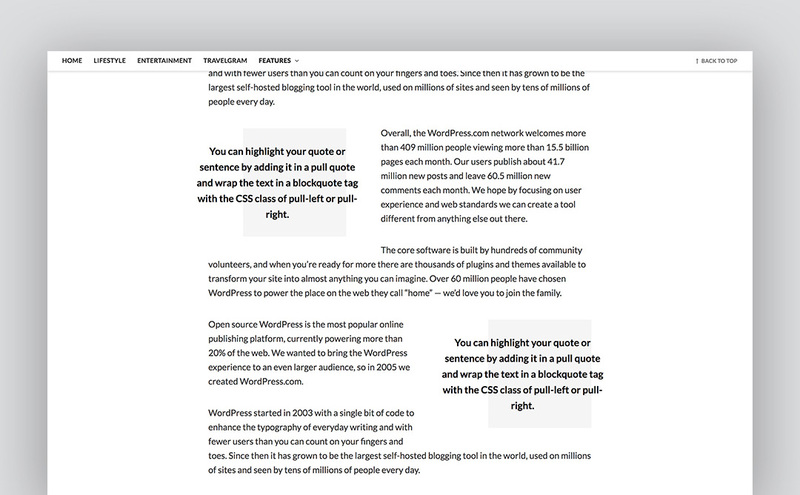 You can highlight your quote or sentence by adding it in a pull quote and wrap the text in a blockquote tag with the CSS class of pull-left or pull-right. A drop cap is a large letter at the beginning of a paragraph. To add a drop cap, simply wrap the first letter of your paragraph with a “span” tag that has “dropcap” class. <span class="dropcap">W</span>ordPress started in 2003 with a single bit of code to enhance the typography of everyday writing and with fewer users than you can count on your fingers and toes. Couldn't find what you're looking for? Send an email to the link below. We'll do our best to answer all support requests within 24 hours, excluding weekends and U.S. holidays.